Hi. I'm Kat. And I used to blog all the time on this here blog, but haven't actually sat down at my laptop to type something in a very long time. Seriously, with smart phones and texting, who types on a regular keyboard anymore? Sheesh. But I figured it was time. I was perusing my Instagram account and kept seeing all these amazing DIY projects people have been tackling, and I got the itch to do dive back into the DIY pool. And blog about it. Shoot, we used to be total DIY champs back in the day (seriously, check it out). So, here we go: our latest DIY project. And this project was a from-scratch thing. Mitch literally made this door. 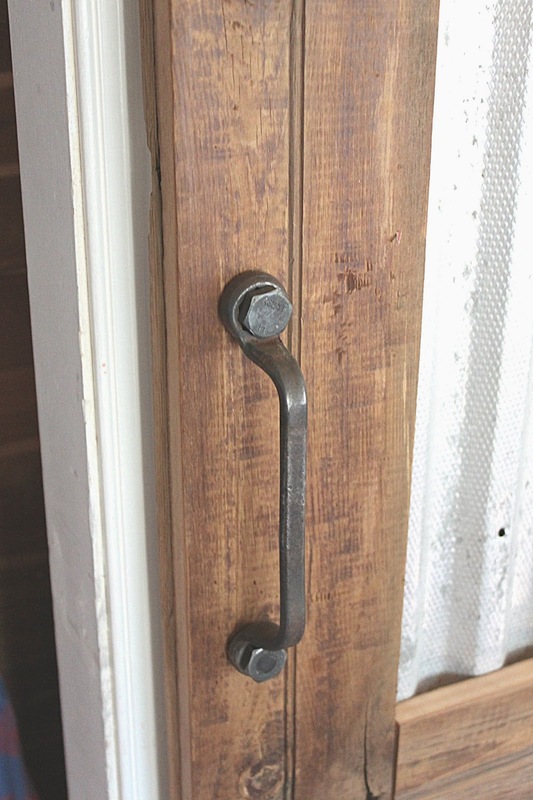 Like from boards and tin and an old barn door track. It's pretty awesome. We shrunk the closet to make room for a tub on the other side of that wall (wish I could say the boys' bathroom was finished or getting there, but it's the project that never ends. Actually I guess it would help if we actually worked in there from time to time!) 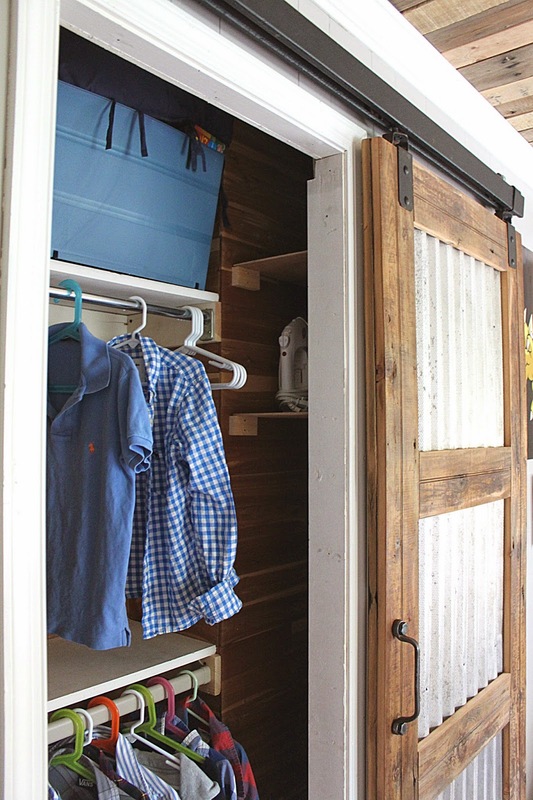 We made the inside of the closet super functionable by adding two rods and shelves. 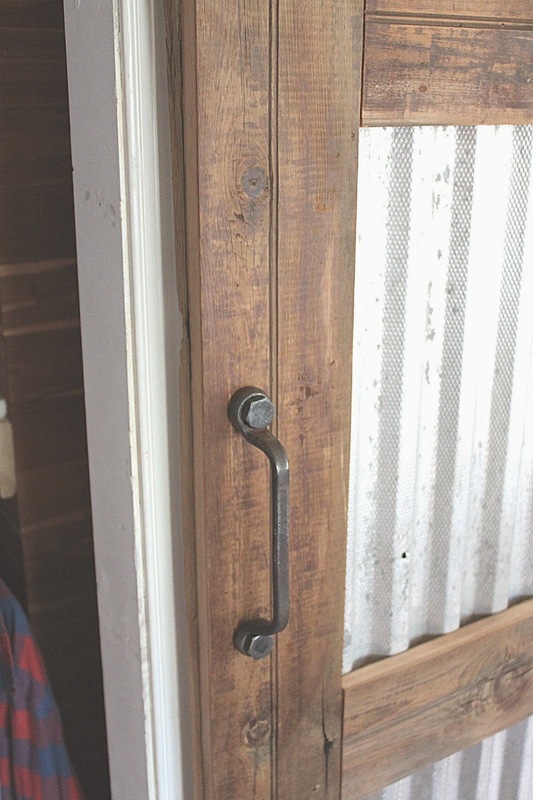 And we thought that a barn style door would be the icing on the rustic-looking cake we got going on here. Friends of ours hooked us up with all the supplies. They replaced a door on their barn a while ago, so they had the track just lying around as well as the barnwood and tin. Thanks, Willie and Rosanne!! See all the storage space inside? That skinny area is where I keep my ironing board and the two shelves above is for the iron and a humidifier. Another fun touch of this door is the handle. If you follow MLST on Facebook, you might have seen our handle before we installed it. It actually wasn't a handle at all. Some of you guessed its function in another life--a wrench. It's an old Ford Model A wrench from the 1920s, from what I gather. We loved it as soon as we saw it in an old hardware store that sells random junk. And thought it'd be perfect in a boy's room. We paid a whopping $2.50 for it. Mitch's brother bent it so it would lay flush against the door (it was off-kilter because it was a wrench). He heated it and bent it slightly so we could use it as a handle. Isn't it perfect? 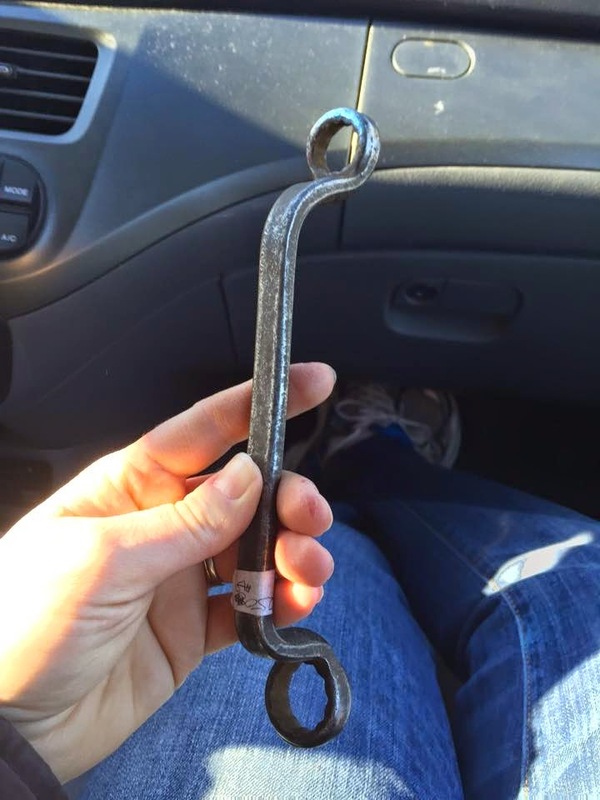 We found two old bolts at the same hardware store that were the same color as the "handle" so Mitch was able to use them to hold it in place. Done. 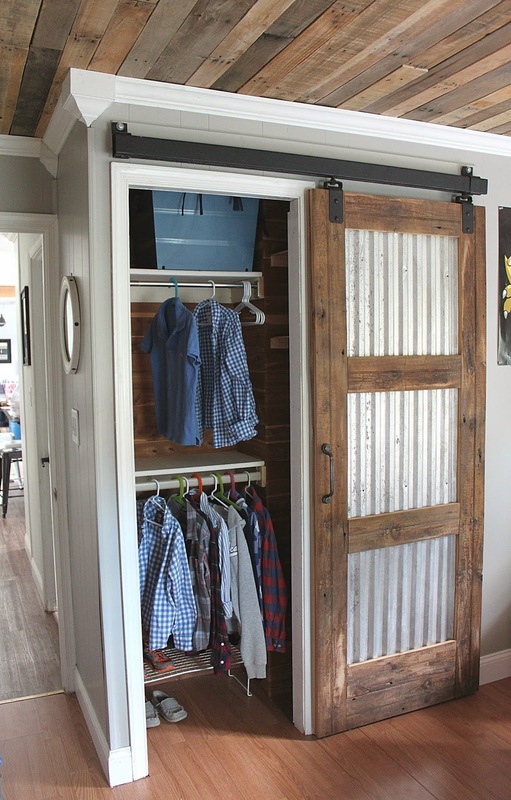 I'm gonna have Mitch come back with a step-by-step tutorial on how he made this awesome barn door. Oh and if you're super observant, you may have noticed those aren't Finn's clothes hanging in that closet. We did the ol' switcheroo and Finn is now in with Bryce. Ry has his old room back once again (so I'll show you that here soon). It's good to be back! I've missed you guys. Where did your friends get the track from? I'm looking for the how to plans also please. This is amazing! I so want to come visit your home someday. 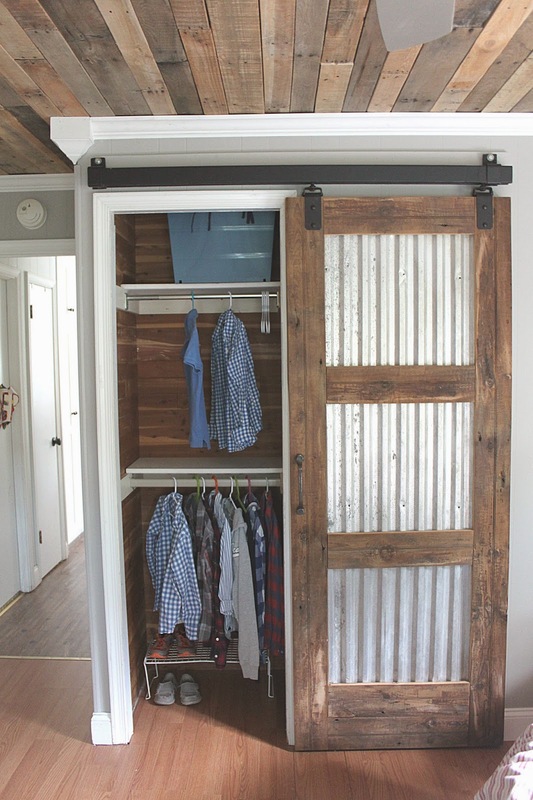 I would like to see the DYI barn door. 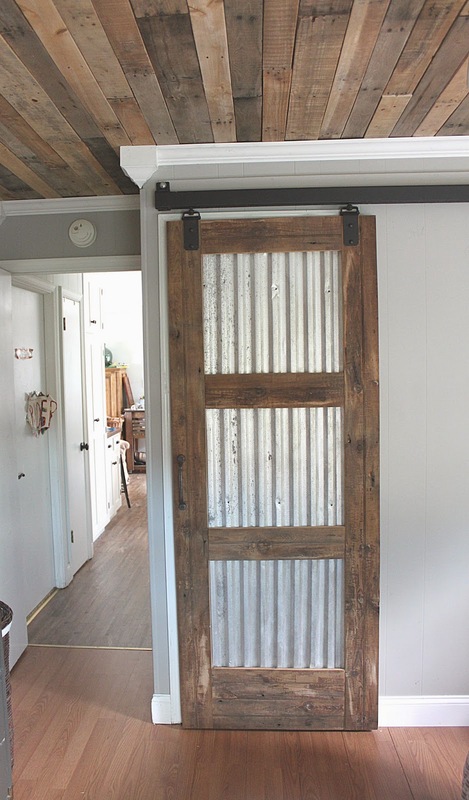 I want to make these doors for my kitchen and it would be great to see how you handled the tin. Is there a DIY video from Mitch yet? Please post!